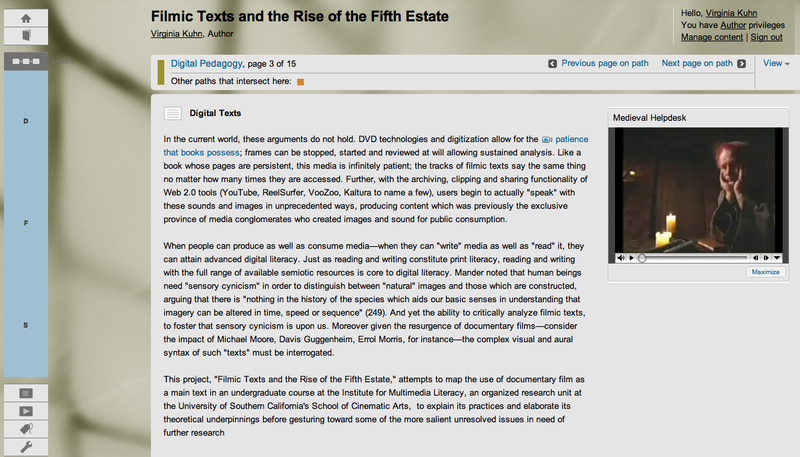 Aside from this path which describes the rationale for this book's structure and the affordances of Scalar, the emergent platform in which it is created, there are two major paths for traversing "Filmic Texts and the Rise of the Fifth Estate." 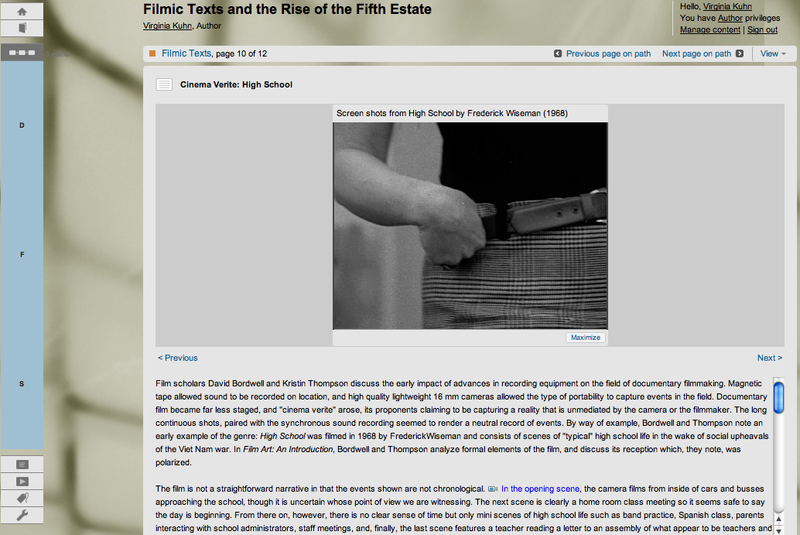 One is the Filmic Texts path which includes descriptions of the pedagogical approach to using a film as a main text in an undergraduate course, along with the theoretical underpinnings of the approach. 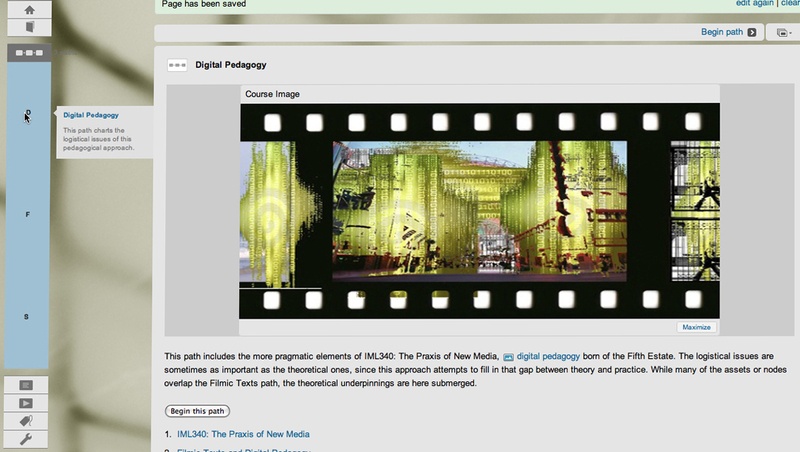 The second is the Digital Pedagogy path, which addresses more logistical issues and discusses the nuts and bolts of launching a class that uses filmic media as both textbook and the mode for student production of texts. There is naturally some overlap in the 'pages' of each and one may move back and forth between the two paths. Thus there will be some repetition. For this reason, each 'page' or node includes a certain amount of recursivity; unlike traditional scholarly argument in which each concept or idea builds upon the one before, the 'pages' of this text must, to a certain extent, be able to stand on their own. While it is true that a conventional book's pages may be accessed in any order at the reader's whim, the expectation is that the ordering is deliberate, usually hierarchical, and always dictated by the author. Indeed, surrendering some of this control can be quite disarming for a scholar and I am no exception. A partial remedy to this discomfort comes in constructing a rationale such as this, for by disclosing the justification for authoring choices, I attempt to situate my work in the larger conversation about the changing ways in which knowledge is produced via academic argument. 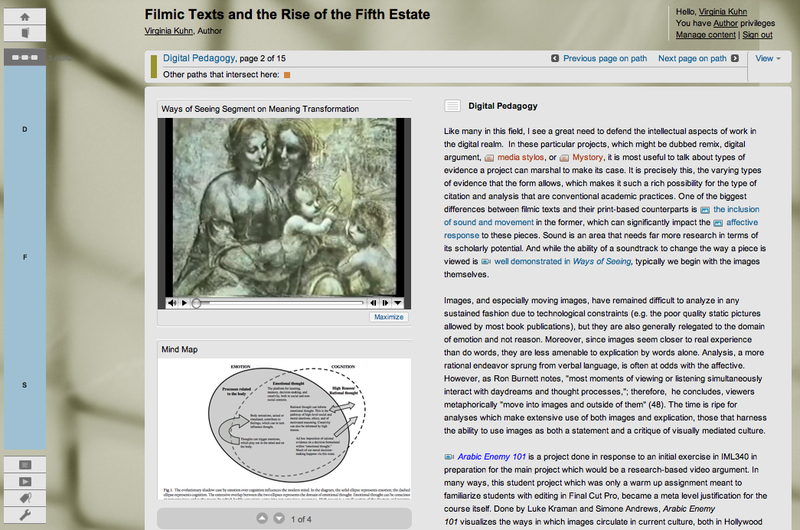 Part of the work of digital scholars, I firmly believe, is to help shape the tools that will be used for research, scholarship and pedagogy, rather than blindly adopting platforms and software created for commercial purposes. To this end, I endeavor to pilot new platforms in both my teaching and my scholarship whenever possible. In 2005, I defended one of the first born-digital dissertations in the US, using TK3, a multimedia authoring tool that allowed one to integrate word, sound, links and still and moving images without extensive programming. Scalar represents the best of TK3, updated for the Web 2.0 world, and I find that very exciting. I am amazed at the level of sophistication that Scalar affords and it has been an incredible pleasure to work with its developers. 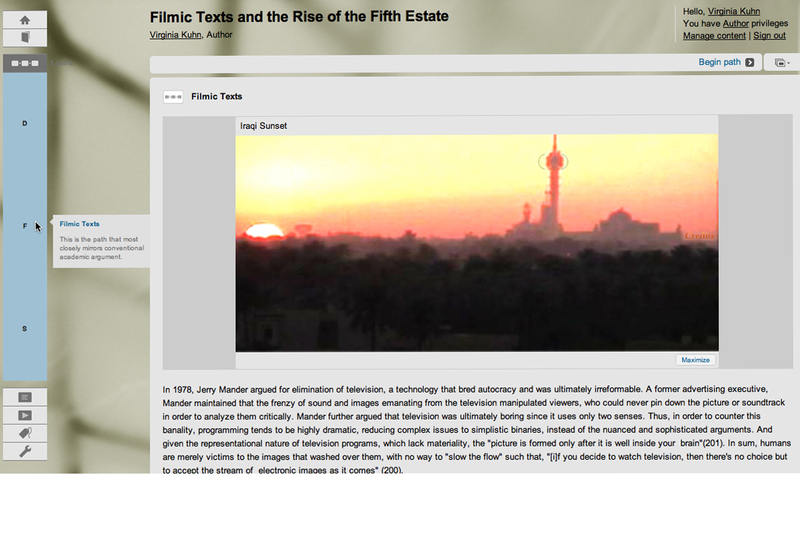 My dissertation, titled Ways of Composing: Visual Literacy in the Digital Age, analyzed the scholarship of rhetoric and composition, film studies and visual studies, and identified three stances that characterized the approach to the visual and the textual: the image-based, the text-based and the hybrid-based. The features of each correlate extremely well with the three page views offered in Scalar (media-centered, text-centered and split-view respectively). And since my dissertation concludes by championing a hybrid-based approach, one which views words and media as equally important semiotic modes for the communication and expression of ideas, it comes as little surprise that most of the pages in this project are created in the split-view, though that was not my conscious intention. Discussion of "Reading this Text: Two Paths"
Version 14 id 8118 of this page, updated 22 January 2011 by Virginia Kuhn. Created by Virginia Kuhn.